Under the leadership of Narendra Modi, India today seems more outspoken on the global stage. When asked to formulate a standard two-page report on its Intended Nationally Determined Contribution (INDC) in preparation for the 2015 Climate Change Conference, India defeated all European expectations by coming up with a detailed report of nearly forty pages, playing an active role in negotiations and standing firm on its commitment to the Paris Climate Agreement despite Donald Trump’s actions. During a separate public event, the former Indian Foreign Secretary S Jaishankar articulated a rare stance: taking a dig at the grand Chinese Belt and Road Initiative (BRI), he said “India has been a pioneer of connectivity, and I am not talking about the Grand Trunk Road which came much later. We have more ownership of the Silk Route than anyone else. We may have lost that branding at some point”. Brand India has evolved. With its population of 1.3 billion and its economy of USD 2.5 trillion, India is today one of the fastest-growing markets in the world. From a strategic perspective, Trump’s administration has assigned to India – one of the largest purchasers of arms supplies – a prominent role in its strategy in Afghanistan, and Singapore is urging India to connect more boldly with the ASEAN member countries. Prior to his first official visit to India, the former United States Secretary of State Rex Tillerson stressed the need for New Delhi and Washington to strive for new and sustainable financial mechanisms in the Indo-Pacific region in order to prevent developing economies and fledgling democracies from falling into Chinese debt traps and losing their sovereignty. Indian expectations are understandably high, but the Elephant is also aware of China’s formidable growth. With its economy of USD 11 trillion and mighty military infrastructure and cyber capacities, Beijing is a veto-wielding, feisty adversary that challenges the rise of India. For a long time, the humiliating defeat by China in the 1962 war has shaped Indian responses and policies vis-à-vis Beijing. India is now overcoming the shadows of the past, but the Great Wall of China is not easy to climb. In 2016–2017, India–China bilateral trade amounted to USD 71 billion, but India still has an alarming trade deficit of USD 51 billion. The long-standing dispute on the Sino–Indian border remains a thorny issue despite multiple rounds of negotiations. Intrusions across the Line of Actual Control (LAC) and military stand-offs like that of 21 days in Depsang in 2013 or, more recently, of 73 days at the India–Bhutan–China tri-junction of Doklam, have reinforced existing trust deficits. China has emerged as the single biggest hurdle to India’s ambition for a seat among the 48 members of the Nuclear Suppliers Group. In the UN Security Council, Beijing continues to shield terror masterminds such as Masood Azhar and Zaki ur Rehman Lakhvi, who are state-sponsored by Pakistan, China’s all-weather friend, but wanted by India for heinous acts of violence. India strongly opposes the China–Pakistan Economic Corridor (CPEC) – a project linked to the BRI and originally valued at USD 46 billion – as it crosses the ‘illegal territory’ of Pak Occupied Kashmir (POK). Meanwhile, China is quickly extending its influence on India’s immediate neighbourhood (Nepal, Sri Lanka, the Maldives and Myanmar) through aid and infrastructure. On the other hand, the asylum granted by India to the Tibetan spiritual leader, the Dalai Lama, is a big sticking point as Beijing accuses the religious leader and Nobel peace laureate of political machinations intended to fuel the fire of secession in Tibet. India’s foreign policy, extending beyond the Indian Ocean to the South China Sea, has raised eyebrows in Beijing, too. In January 2015, a first draft of the US–India Joint Strategic Vision document finally brought home the South China Sea dispute, shaking off India’s long, cautious silence on Sino expansionism in the maritime domain. Over 55 per cent of India’s trade passes through the sea lanes of the South China Sea and the Strait of Malacca, a trade route worth USD 5 trillion in total. 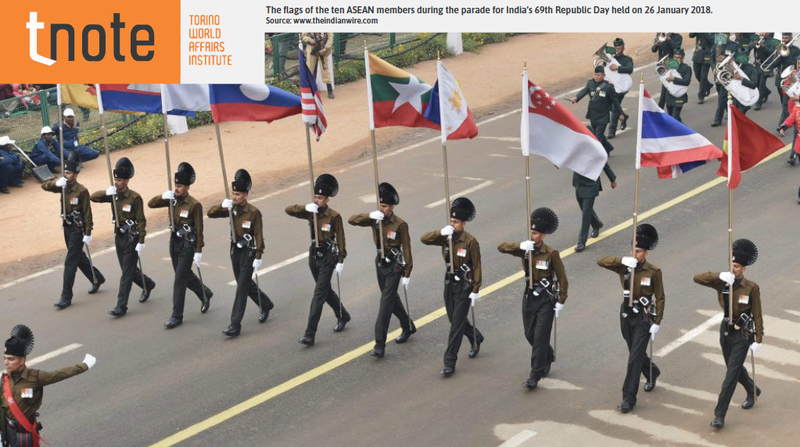 From China’s standpoint, the United States, Japan and South Korea remain top priorities, but India’s traditional links with and arms sales to Vietnam, as well as efforts to increase its influence in Southeast Asia – well represented by the unprecedented invitation of the ten ASEAN leaders to be guests of honour at the celebrations for India’s 69th Republic Day on 26 January 2018 – remain irritants to Beijing. While objecting strongly to New Delhi engaging ASEAN, Beijing keeps a close eye on India’s deepening ties with bloc members and with oil and gas exploration drives in the littoral states of the South China Sea. Despite sharp differences, there have been points of convergence between the two Asian giants in global fora in the past. During the 2009 Climate Change Conference in Copenhagen, Chinese Prime Minister Wen Jiabao reached out to his Indian counterpart, Prime Minister Manmohan Singh, for his support against mounting pressures from Western countries. China and India also forged their cooperation in other multilateral fora including BRICS, the New Development Bank and the Shanghai Cooperation Organisation (SCO). But dynamics have changed now. In his book How India Sees the World, former Foreign Secretary of India Shyam Saran writes “China is determined to shape the international political and economic order in a manner aligned to its own interests. But in this quest, it no longer regards India as a source of support. Under Xi Jinping, it seeks a new type of ‘great power relations’, benchmarking itself with the US”. Today, following the 19th Communist Party Congress (CPC), President Xi Jinping has an elevated status that can be bracketed with Mao Zedong and Deng Xiaoping. In his keynote speech at the CPC, Xi expressed pride in Beijing’s assertive actions in the South China Sea and set the target of becoming a global leader by 2050. Packaged in hyper-nationalism, China’s bellicosity on land and sea will continue to challenge the international rules-based order it claims to uphold. In dealing with a formidable China, India will have to exercise patience and prudence. Until India gets its internal governance right and reduces the economic and military gap with China, there is not much it can gain by poking the Dragon without adequate firepower. It is nevertheless possible to countervail the adversary through regional coalitions of like-minded countries opposed to Beijing’s unilateral assertion of power. India is indeed collaborating closely with the United States and its key allies in the region. The Quadrilateral Security Dialogue between India, the United States, Japan and Australia – first initiated in 2007 but cut short a year later by the Kevin Rudd government – was revived last year thanks to Indo-Pacific policy supported by the Japanese Prime Minister Shinzō Abe. But a transactional Trump will also need Beijing to contain the nuclear threat posed by North Korea. Meanwhile, the efforts made by ASEAN to hammer out a free trade agreement with six nations including India and China could be a new platform for cooperation between New Delhi and Beijing. As a Chinese proverb goes, “Just as distance tests a horse’s strength, time will show a person’s sincerity”. Whether the Chinese dream will lead to an economic boom or, rather, to a nightmare in the region will depend on how Xi steers the Sino–Indian relationship.